Your donor database: get a real one now! OK, fundraisers and nonprofit people: you gotta have a real donor database. Seriously. Not Excel. Not some do-it-yourself database patched together in Filemaker by your cousin Vinny. Not your Quickbooks accounting software. Not your Outlook address book or your MailChimp subscriber list. And I’m going to ruffle some feathers and suggest that you avoid Salesforce, even though it’s free for nonprofits. These are all wonderful software tools. But…. 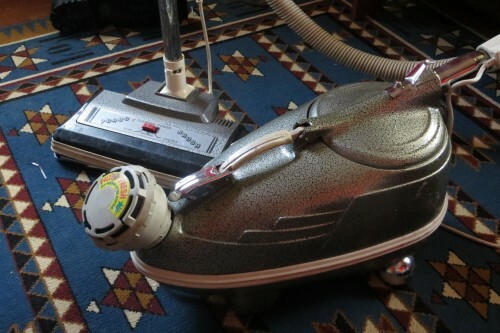 Let me ask you this: would you try to build your own vacuum cleaner? Would you try to adapt your leaf-blower or hair dryer to clean your floors? Heck, no! It would cost too much, take too long and you’d have a lousy vacuum cleaner at the end. Gayle makes fun of our vintage vacuum cleaner. But it’s still the right tool for the job. You can plunk down anywhere from $45 to $600 dollars for a vacuum cleaner at Target today and start sucking up dirt this afternoon. You can buy parts and get repairs almost anywhere or anytime. It’s the same with dedicated donor management systems. Why use do-it-yourself solutions to a problem that professionals solved long ago? Anthony Bakker created the Blackbaud company (which sells Raiser’s Edge) in 1981. For the last 35 years, Blackbaud and its dozens of competitors have been refining, perfecting and adapting their donor database softwares. Every day they strive to meet the evolving real-life needs of frontline fundraisers at the world’s large and small nonprofit organizations. There is no reason you should use anything but a dedicated, professionally developed, off-the-shelf system specifically created to manage nonprofit donor programs. A good fundraiser will have this tool open nearly all the time. It’s the system that organizes a fundraiser’s day, recording new gifts, taking notes on donor contacts, assigning tasks to staff and volunteers, setting campaign and donor targets, launching segmented emails, mailing and other appeals. And much more. The more difficult question is which one to get. There are dozens if not hundreds of products described as donor management software. Costs range from free to thousands of dollars per month and the feature sets vary at least as widely. Some of them won’t work well for you. Some of them don’t work well for anyone. No one can stay current on all the donor databases out there. These roundups at Idealware and TechSoup are years old. We can’t keep up either. And we’re not primarily database professionals. But we’ve worked with several of the most-used systems. In a next post, we’ll look at some ways you can zero in on the right donor database system for your nonprofit. But if you want to save time, here’s our current top pick for most smaller nonprofits: Little Green Light. We love Little Green Light. Tell you why soon.